On 2/20/18, the Faculty Federation of Raritan Valley Community College passed a resolution supporting policies that promote public transit. The connection between this issue and labor is far stronger than might appear at first blush, according to RVCC economics professor Dan Aronson. 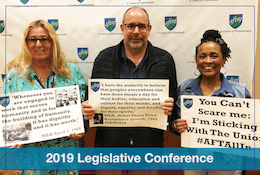 A North Jersey Mayor, a Central Jersey Assemblyman and the new Commissioner of Labor are winners of AFTNJ awards and recognition at the Legislative Conference awards luncheon April 14 in Atlantic City. Baraka (left) accepts endorsement from DelGrosso (to his right) in 2014. 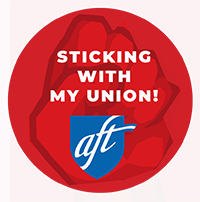 Voting for 29 AFTNJ positions will take place at the AFTNJ Convention April 14, 2018 by registered delegates in accordance with the AFTNJ constitution. 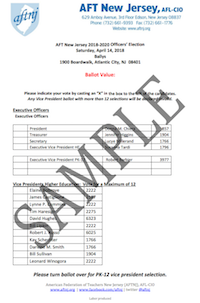 The 2018-2020 sample ballot has been distributed to delegates in advance of the April 14 convention.